Diversification of Investments: Everything You Need to Know | Pure Financial Advisors, Inc. Diversification is an important strategy for any investor because it can help to reduce systematic risk or the risk of the overall market. We accept that risk by being invested in the market in general, but why take on additional types of risk when they can be reduced? Investment portfolio diversification allows us to reduce non-systematic risk. This does not mean that we can just keep adding additional investments until we reach a certain number and have meaningful diversification that gives us a material reduction in risk. Let’s look at some possibilities of various levels of diversification that real-world investors frequently hold. By starting with little diversification and looking at more diverse options, we can more clearly see the benefits of diversification. This investor is an enthusiast for the one stock for any number of reasons: a tip was received, he knows the industry or her family member in another state has done well with the company. Perhaps the investor inherited or otherwise received the position and just hasn’t gotten out. For whatever reason, the investor owns one company and nothing else. The positive view of the stock may be warranted but this investor is taking a very large amount of risk. 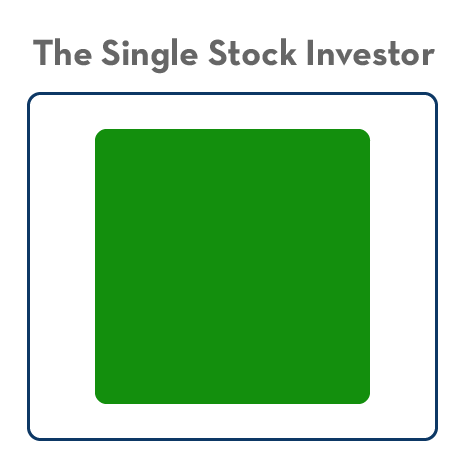 It wouldn’t be accurate to say a single stock owner has no diversity since some companies are involved in a variety of activities or have ownership stakes in subsidiaries, but it is true that the single stock investor has accepted substantial risk that can easily be reduced by diversification. This often leads investors who find themselves in a similar situation to consider branching out to own other companies as well. Unfortunately, these companies are often very comparable. Like the single stock investor, the owner of several similar companies (perhaps those in the same industry or geographic region) also takes on a large amount of risk that can be diversified away. There are many types of investment bias that investors hold. This can be an industry bias based on our own knowledge from our career, for example. It might be typical for those in the northeast to own more bank stocks and those in California to own more technology companies. We’re all more comfortable with what we know, although by focusing exclusively on companies from a single industry or geographic area (often this is a bias toward domestic companies only) it is possible to accept more risk than is necessary. Those who have a handful of similar companies often find that they can achieve more meaningful diversification by investing in companies from different industries, sizes, and geographic locations. The next step for the investor who has stocks that are like one another is to consider holdings that are dissimilar in one or more ways. The computer programmer who owns five large-cap domestic technology companies might decide instead to hold one tech company, a big box retailer, a pharmaceutical company, a bank, and an automobile manufacturer. To add a bit of variety to the mix outside of the industry, let’s assume that these companies vary in sizes and some are international rather than domestic. This investor has achieved a certain level of diversity and one can easily point to the large-cap domestic tech company as being a significant diversion from the European Pharmaceutical small cap company. With all that said, this investor still does not have the most meaningful type of diversity, which is diversity among rather than within asset classes. In our previous example, an investor had five “things.” Specifically, they were five companies of diverse sizes in different industries and geographic location. Sounds diverse, right? While this certainly is diverse compared to our first example, the single stock investor, there is still more work to be done. With the type of diversity. Instead of the five companies previously mentioned, our investor may instead diversify by owning a stock fund, a bond fund, a real estate fund, a commodities fund, and cash equivalent items. Notice that in this example the investor still has “five things” but there is now an important distinction in that there is diversity among asset classes. The investor has not only different assets but distinct types of assets. This investment portfolio diversification is important because different asset classes are not necessarily highly correlated with one another. It’s worth taking a moment to address what is considered correlation before addressing how important holding assets that are not heavily correlated to one another can be for an investor. Any two things in the world that are correlated to one another react similarly or share interdependency. We could say that the presence of rain has a higher correlation to automobile accidents than the presence of sunshine. This means that if it is raining, there is a greater likelihood that automobile accidents will occur. In this example, correlation and causation both exist. The rain can be said to cause the accidents. It is important to note, however, that correlation is not necessarily causation. One common example is the performance of the economy and the presence of a certain type of elected official (by party, for example) in office during the economic activity. While some will argue the current administration at the time is responsible for the current economy (good or bad), others may argue that the current economy is the result of the previous administration, while still others will argue that the economy is largely indifferent to either and that the economic activity is not caused by the selection of specific representatives or members of specific parties. If one believes the latter, they would recognize correlation of activity, but reject the idea of causation. Want a simpler example? Most basketball players are tall, but playing basketball is unlikely to make you taller. As investors, we care about correlation of assets but do not necessarily expect or desire a causal relationship in order for the correlation information to be useful. By beginning with how your portfolio will be diversified among asset classes, you are starting with what’s most consequential. This does not mean that other issues such as your selection within asset classes are unimportant, but that you will usually select your house before the appliances, otherwise you may risk choosing items that are not a fit for your overall home. Having selected an overall asset class mixture (or “asset allocation”) we will want to decide what type of diversity is appropriate within asset classes. To use a simple example, if we had determined that only two assets classes of stocks and bonds were desired and that they would be allocated equally in a 50/50 split, next we would need to decide which stocks and which bonds. Depending on the account size, desire for active vs passive involvement and tax consequences, we could come up with a variety of solutions. The possibilities are endless and include highly general as well as highly specific solutions. We could simply purchase one general bond fund and one general stock fund, or perhaps several funds that spread out the type of equities by geography, market cap or industry as well as spreading the bonds out with funds for specific terms, issuers or credit quality. At the most specific level for account balances large enough to render the strategy practical, we could select each individual security. No matter what choices are made for the implementation of the portfolio, it is always important to keep the big picture in mind and focus on an asset allocation that provides diversity such that we are taking the least amount of risk possible to meet our objectives. There are certain situations in which diversity is not possible or practical. One of the most common situations is a concentrated position that needs to be held for tax purposes, illiquidity or restricted vesting date. If you hold an asset that for whatever reason you are unable to diversify away from to minimize your risk, this does not mean that you must simply accept the risk. Diversification is one of many methods of risk management. Assume an investor has a large concentrated position in a single security that has experienced substantial appreciation. They may recognize the benefits of diversity but prefer not to sell the entire position in the current year since they are in a higher tax bracket than normal due to a large payout of unused vacation and sick time when transitioning from one job to another. What should they do? When one needs to maintain a concentrated position, always look for one or more other ways to manage risk. In the specific example above, the owner may choose to sell as much of the concentrated position as possible in the current year without incurring a substantial tax liability, although if this opportunity is not there at all or not meaningful based on the overall tax situation, the investor may wish to hedge to reduce downside risk. This can be done with several ways including options strategies (puts or collars, for example) which are beyond the scope of this article. The bottom line is to always look for effective ways to manage risk and if diversification is not an option try to find something that would be an appropriate risk management tool for the given situation. As you can see from the hypothetical examples of investors from minimal to meaningful levels of diversity, it is important to consider diversification among in addition to within asset classes to reach a material level of investment diversification. 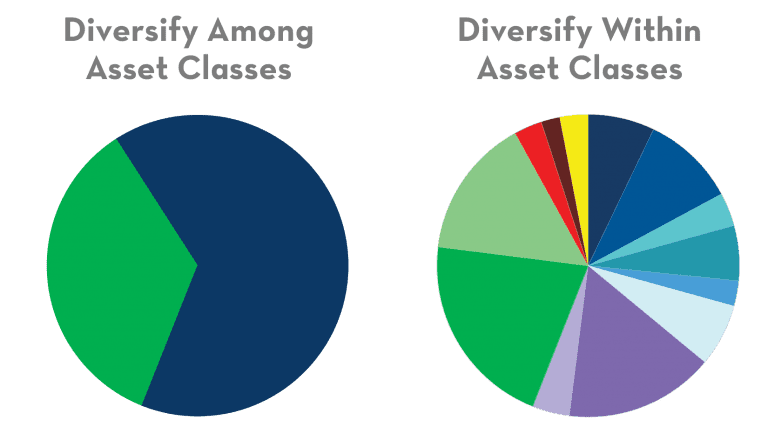 An investor who has a good mix of assets classes and diversity within them, organized to best achieve their goals may still need to consider tax diversification. We, of course, want our investment to be diverse, but investments potentially cause taxes and we will also want to strategically select the account types that various investments are placed in to minimize the tax our investments will generate. Often your tax and investment planning decisions will be made in concert with one another. Investors in the united states have access to three “pools” of money which are tax-free, tax-deferred and taxable. Each pool has different tax treatment and one pool may be a better fit for certain types of investments than another. The process of making these decisions on where to hold your assets is called “asset location” and is an important topic you will want to consider in addition to which assets you own, your asset allocation decision. You may wish to review our additional education content on asset location and tax diversification in order to understand how these important concepts may work in conjunction with your decision to diversify your portfolio. The process of diversifying your portfolio can seem complex to some investors. It can involve decisions not only related to the appropriate investments to select, but when and how to do so to minimize transaction costs and taxes. Consider a consultation with a CERTIFIED FINANCIAL PLANNER™ professional to discuss which strategies may be appropriate for your portfolio and overall financial objectives. Neither diversification nor asset reallocation can ensure a profit or protect against a loss. There is no guarantee that a diversified portfolio will enhance overall returns or outperform a non-diversified portfolio. Past results do not guarantee future performance. Investment in securities, including mutual funds, involves the risk of loss. This article does not disclose all of the risks and other significant aspects of trading in options. In light of the risks, you should undertake such transactions only if you understand the nature of the contracts (and contractual relationships) into which you are entering and the extent of your exposure to risk. Intended for educational purposes only and not intended as individualized advice or a guarantee that you will achieve a desired result. Questions about personal finances should be addressed to an appropriate professional.